The Mass Extraction Leak Test is a deterministic test method for Container Closure Integrity (CCI) testing. CCI test methods are used in stability studies, routine production QC testing, and new product validations. The test is currently validated for vials up to a maximum diameter of 42 mm and a maximum of 78 mm high. The validated leak size is 2 microns. The test article is placed under vacuum in a Mass Extraction Test Instrument and checked for leaks. Mass flow values below the predetermined leak threshold are reported as “pass,” and values above the predetermined leak threshold are reported as “fail.” This test represents a deterministic process for evaluating container closure integrity. 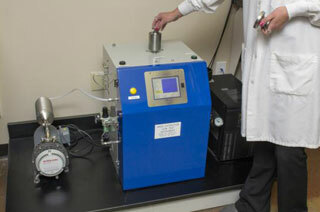 Advantages to performing Mass Extraction include fast turnaround time, minimized cross-contamination potential, reduced drug matrix and test system compatibility issues, reduced sampling requirement (no additional control samples needed), and non-destructive testing, which allows for retest and confirmation of failed articles (containers can be returned intact for failure investigations). The test result and mass flow value are reported. If you have additional questions about Container Closure Integrity: Mass Extraction Leak testing services, or would like to consult with the experts at Nelson Labs, just send us a request or call us at +1 (801) 290-7500.